The lightsaber - powerful, iconic, cool. There's no fan of Star Wars who hasn't imagined at least once what it would be like to wield the almighty weapon. 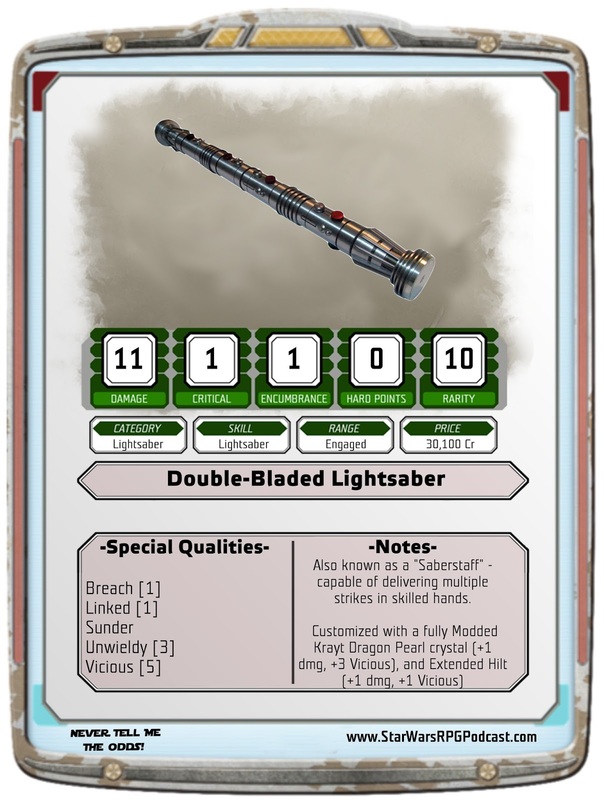 Fantasy Flight Games includes stats for the basic lightsaber in the Edge of the Empire and Age of Rebellion core rule books, but what about the more exotic varieties? From Darth Maul's double-bladed lightsaber to Kylo Ren's "broadsword" style lightsaber, to even more exotic varieties like Typhon Soont's "fan blade", there is a whole range of variant lightsabers that can be incorporated in your game. All the lightsaber stats below are based on the official rules laid out in the Force and Destiny rule book and other official sources. The standard lightsaber, emblem of both Jedi and Sith power the galaxy over. Easily capable destroying enemy weapons with the Sunder ability, while Breach allows it to ignore the first 10 points of Soak from a target (or 1 point of Armor on spaceships). Even more awe inspiring, it's capable of dealing terrible critical injuries through the combination of extremely low critical threshold (requiring only 1 Advantage to deal a critical injury) and Vicious 2 features. Remember that multiple critical injuries can be caused on a single attack, making this a truly deadly weapon in trained hands. The stats and price here are based on the lightsaber stats from Edge of the Empire and Age of Rebellion. However, the new rules in Force and Destiny suggest that the price should actually be 11,800 credits, and that the lightsaber is equipped with a fully modded Ilum Crystal. More information on lightsaber crystals will be coming in a later post. Made famous by the Sith Warrior Darth Maul, the Double-Bladed Lightsaber requires considerable skill to use properly. However, in the right hands it's capable of mowing through opponents in a way that can shock even other lightsaber wielders. Although it requires an Agility of 3 or better (Unwieldy 3) to use properly, it is truly deadly in talented hands. Any successful hit that generates two Advantage or more can be used to activate the Linked 1 quality, dealing an additional, automatic hit at full damage! Darth Maul's double-bladed lightsaber, represented here, features an extended hilt, and Krayt Dragon Pearl as the focusing crystal. The pearl has been fully Modded to further enhance the blades' damage and amplify the Vicious quality - adding +50 to every Critical Injury roll. Combined with the Linked quality, a single good roll can almost effortlessly slice an uninjured opponent in half. As any crystal modification necessarily applies to both blades, the cost of upgrading the weapon to this level of potency is prohibitively high - making Darth Maul's double-bladed lightsaber one of the most expensive in the known galaxy. An extremely uncommon variety of lightsaber - most famously favored by Kylo Ren. The overbuilt cross guard hilt gives the blade its distinctive appearance, and grants a practiced wielder additional Defensive qualities and an Advantage bonus in combat. In essence, the cross guard hilt is a more aggressive variation of the curved hilts favored by more refined duelists. Because of its much larger size, the cross guard hilt requires two hands to wield effectively. Kylo Ren's lightsaber rages with a barely contained plasma blade - the result of the Barab Ingot focusing crystal. More brutal than graceful, the broadsword lightsaber does less damage and has a higher Critical Hit threshold than the standard lightsaber, but in exchange it deals savage burns. The Burn 3 quality means that the blade's searing plasma catches an opponent on fire, and continues to deal an automatic 8 damage per round for 3 rounds after a successful hit. Burning targets are able to make a 2 Difficulty Coordination check in order to extinguish the flames by beating out the flames. There is little poetry in combat against this brutal weapon. 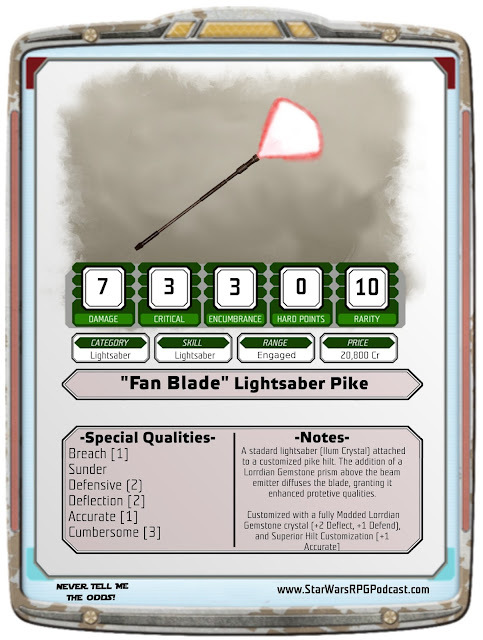 The weapon favored by elite Emperor's Hand agent Typhon Soont, as well as other Jedi who favor style over function, the "Fan Blade" lightsaber pike features several modifications. By attaching a unique diffuser crystal to the top of a standard lightsaber, the normally straight blade is refracted into a short but broad fan or axe head shape. This modified blade is usually attached to the end of a staff, or lightsaber pike, which allows the combatant to dance, twirl and feint with the weapon as he attacks. The broad head grants a proficient wielder a significant boost to his Defense and Deflection. 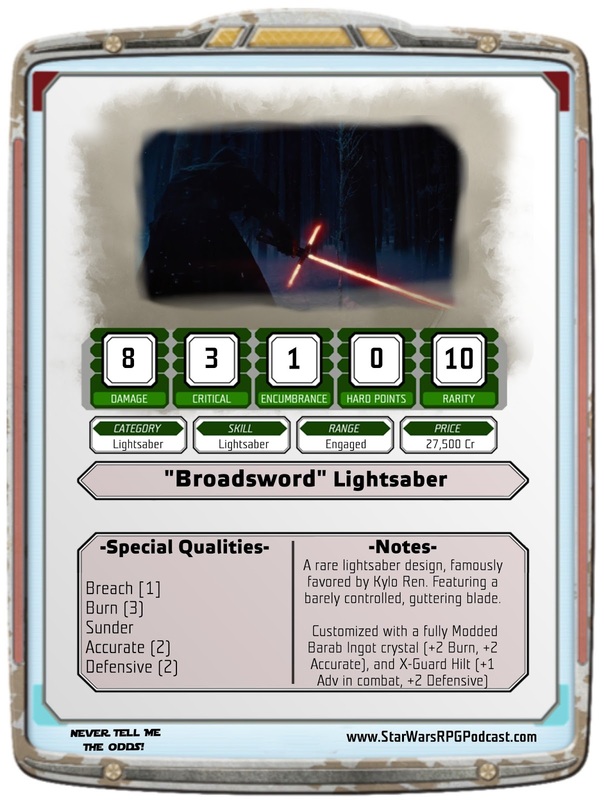 However, due to the diffusion of energy, this type of lightsaber does less damage, has a higher critical hit threshold, and deals less vicious wounds. The fan blade effect is actual the result of two crystals working in tandem. 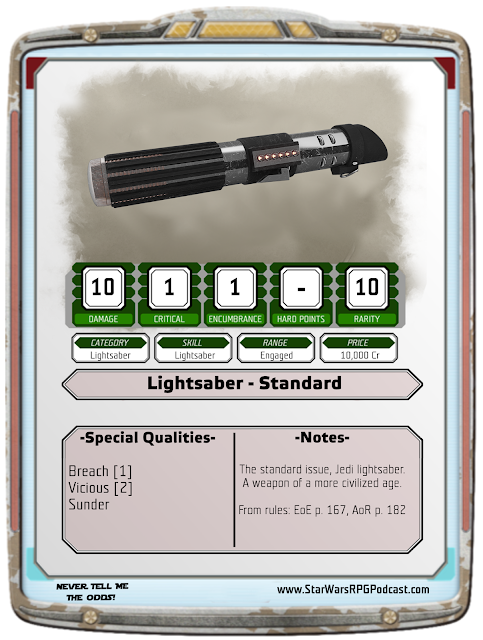 The lightsaber itself features an Ilum focusing crystal - just like the standard lightsaber stats above. The addition of a second, specially designed "diffusing" crystal at the point of the blade emitter is responsible for spreading the blade. In this case, the diffusing crystal is a Lorridan Gemstone. As the blade passes through the diffusing crystal it loses the qualities of the Ilum Crystal and takes on the Defense and Deflection qualities of the Lorridan Gemstone. The diffusing crystal can be Modded in its own right to enhance its capabilities. The diffusing crystals can also be removed from the lightsaber to return it to its base statistics.